3.Press button "Home" on your keyboard to activate the trainer (wait 1-5 sec.). Last edited by ArmY of 0n3 on Fri Nov 23, 2018 6:49 am, edited 2 times in total. Hey thanks for your work! Is this compatible with the legitimate Steam version? When I press Home I get a prompt saying "Please Wait..." with an "Ok" button but even if I wait 30 sec, 1 minute, this window stays. Clicking on "Ok" doesn't seem to do anything and none of the options work. The trainer does detect my game is On though (it's written in green). It may not work under the Steam version, if the game has undergone updates. The game has yet to receive an update afaik. So it should also be at 1.0. I'm also having the same issue of starting the game then pressing Home Key and the Please Wait... prompt stays up and doesn't close. I'm using windows 8.1 and the steam ver. 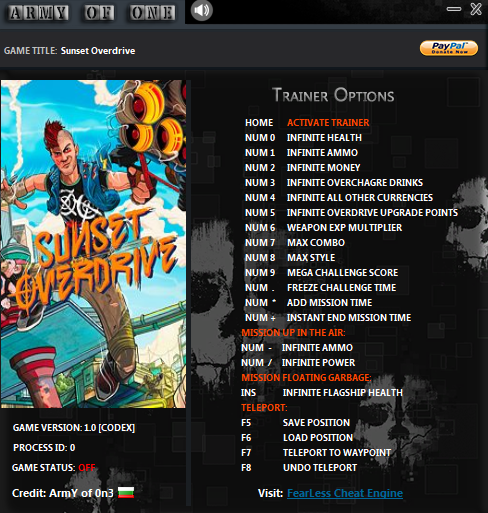 of sunset overdrive if that helps maybe heh. Okay guys, try once again download the trainer. I made minor changes on it. And it now work flawlessly! Thank you very much for your hard work! Am i the only one who encountered corrupted archive every time i downloaded it. Cant extract the rar file at all. Edit: nvm, it seems my browser somehow makes the archive corrupt, downloaded it from phone and its ok.
Update your winrar and try again. Infinite money and currencies not working.Saying address not found. Hi, I am using windows 10 and codex version, but I cannot activate at all. The activation pops up and stays forever, and if I click okay. The new window says address not found try to restart the game or trainer. Try to first Start Game, then Trainer and Press Home ! Somehow, trainer mutes all game characters' speech and chatter after some time of use.